For the English punk band, see The Models. Models are a rock group that was formed in Melbourne, Australia, in August 1978. They went into hiatus in 1988. They are often referred to as "The Models" (Mark Ferrie refers to "The Models" in his work bio for example). They re-formed in 2000, 2006 and 2008 to perform reunion concerts, and began regularly performing again from 2010 onwards. "Out of Mind, Out of Sight", their only No. 1 hit, appeared on the Australian singles charts in July 1985. The related album, Out of Mind, Out of Sight, peaked at No. 3 on the Australian albums charts after its release in August. Out of Mind, Out of Sight appeared on the Billboard 200 albums chart, with the single, "Out of Mind, Out of Sight", peaking at No. 37 on the Billboard Hot 100 singles chart. An earlier song from the same album, "Barbados", had peaked at No. 2 on the Australian singles chart. Models early line-up included Andrew Duffield on keyboards, Mark Ferrie on bass guitar, Janis Freidenfelds (a.k.a. Johnny Crash) on drums and percussion, and Sean Kelly on vocals and lead guitar. A later line-up was mainstay Kelly on guitar, James Freud on vocals and bass, Roger Mason on keyboards, Barton Price on drums, and James Valentine on saxophone. Backing singers in the group included Zan Abeyratne and Kate Ceberano (both from I'm Talking) and Canadian-born Wendy Matthews. In early 1989, Duffield, Kelly, Matthews and Valentine were members of Absent Friends. On 27 October 2010, Models were inducted into the ARIA Hall of Fame by Matthews. In 1977 Melbourne school friends Sean Kelly and James Freud formed their first band, Spread, which was soon renamed Teenage Radio Stars. They recorded two tracks for Suicide records' Lethal Weapons label. Singer and guitarist Sean Kelly left in 1978 to form Models with bass guitarist Peter Sutcliffe (a.k.a. Pierre Voltaire and Pierre Sutcliffe, who won $503,000 in May 2014, on Australian TV quiz show Million Dollar Minute) and Ash Wednesday (formerly of JAB on keyboards, Sutcliffe and Janis Friedenfelds (a.k.a. Johnny Crash) on drums and percussion. Models were more pop influenced than the earlier punk bands and had a wider appeal. The initial version of the group did not stay together for long as, after six months, Sutcliffe was replaced on bass by Mark Ferrie (ex-Myriad). In August 1979, Wednesday was replaced by Andrew Duffield from Whirlywirld on keyboards. Their first release in October 1979 was a give-away, shared single, "Early Morning Brain (It's Not Quite the Same as Sobriety)" backed with The Boys Next Door's "Scatterbrain". Friction within the band led to their decision to break up in November 1978. However they rapidly reformed at the end of December when Ex-The Easybeats members, Harry Vanda and George Young, who were now record producers and songwriters, offered to cut some demos for them –  Their second single, "Owe You Nothing" appeared in August 1980. Both singles were released on independent labels and did not chart on the Top 40 Australian singles chart according to the Kent Music Report. Models performed extensively both locally and interstate, supporting the Ramones, The B-52's, XTC, The Vapors and Midnight Oil on national tours. Rather than signing immediately, the group financed the recording of their first album to guarantee creative control. In November 1980, the Duffield, Ferrie, Friedenfelds and Kelly line-up released their first album, Alphabravocharliedeltaechofoxtrotgolf. They then, under manager Adrian Barker, signed to Mushroom Records and, as a sign of its respect for the band, the label agreed not to release any singles from the album, which peaked at No. 43 on the Australian Kent Music Report Albums Chart. It was well received by audiences on the live pub circuit. The group intended to record completely new material for their studio albums. Much of their earlier work was unreleased until 2002, when Models Melbourne, a compilation album of live material, was released. Models' early style was a spiky, distinctive blend of new wave, glam rock, dub and pop: which included Kelly's strangled singing voice, Duffield's virtuoso synthesiser performances (he used the EMS Synthi AKS), and the band's cryptic, slightly gruesome, lyrics (e.g. "Hans Stand: A War Record" from Alphabravocharliedeltaechofoxtrotgolf), which were mostly written or co-written by Kelly. Early in 1981, following a support slot for The Police, the group signed an international deal with A&M Records. Friedenfelds was replaced on drums by Mark Hough (a.k.a. Buster Stiggs) from New Zealand band The Swingers before recording commenced on their international label release. Friedenfields went on to play with Sacred Cowboys, Beasts of Bourbon, The Slaughterman and Tombstone Hands. The band went to England to record with producer, Stephen Tayler producing. at Farmyard Studios, these tracks becoming the album Local and/or General. In June, demo sessions recorded earlier in Australia album so impressed the band that they were released as a 10" mini album, Cut Lunch (July 1981), which was produced by Tony Cohen and Models except one by Split Enz keyboard player Eddie Rayner. Cut Lunch peaked at No. 37 on the albums chart and at No. 38 on the singles chart. It included the whimsical pop tune, "Two Cabs to the Toucan". In October, their second full-length album Local &/or General, was released. Local and/or General peaked at No. 30 and provided the single, "Local &/or General" in November, which did not chart. Both albums helped widen their audience nationally, thanks to regular radio exposure on Triple J in Sydney and on community stations in other cities, as well as national TV exposure through their innovative music videos on programs such as the Australian Broadcasting Corporation (ABC-TV) pop music show Countdown. During 1982, further line-up changes occurred with Ferrie and Hough leaving early in the year. Ferrie went on to form Sacred Cowboys with Garry Gray and Terry Doolan. He later (as of November 2010) became bass player in the RocKwiz house band on SBS TV. Hough became a graphic artist, art director and designer. James Freud (ex-Teenage Radio Stars, James Freud & Berlin) joined the band on bass and vocals, with John Rowell on guitar and Graham Scott on drums (both ex-Curse). Kelly and Freud had been in high school bands which developed into Teenage Radio Stars. Freud had a solo hit single, "Modern Girl", which peaked at No. 12 in 1980. Rowell and Scott left Models in May 1982, with Duffield following. New Zealand drummer, Barton Price (ex-Crocodiles, Sardine v) joined. They recorded a single, "On", produced by veteran rocker, Lobby Loyde, and released in August. It had no mainstream chart success, but peaked at No. 1 on the independent charts. Gus Till (ex-Beargarden) briefly joined on keyboards until Duffield rejoined in December. In 1982 they made a film, Pop Movie, which featured animation and live footage of the band, it was screened on TV rock show, Nightmoves, as well as at a few cinemas. Models' line-up of Duffield, Freud, Kelly and Price issued the highly regarded The Pleasure of Your Company in October 1983, produced by Nick Launay. Its big drum sound and dance-ability, reflected Launay's influence, and Freud's more radio-friendly voice made the album more accessible. The album was critically acclaimed and peaked at No. 12, with the single "I Hear Motion" becoming a No. 16 hit. Duffield later explained that the song's distinctive keyboard part had been inspired by a riff from Stevie Wonder's hit "Superstition". "I Hear Motion" was used on the soundtrack for the Yahoo Serious film Young Einstein (1988). The band released two other singles, "God Bless America" and "No Shoulders, No Head", but neither charted into the Top 50. The band supported David Bowie for the Australian leg of his Serious Moonlight Tour in November. Kelly and Duffield were invited to sing backing vocals on the INXS album, The Swing. The video for "God Bless America", from March 1984, featured backing singers Zan Abeyratne and Kate Ceberano (both members of I'm Talking). Kelly appeared ready to disband Models and was even rehearsing with a new band. Mushroom Records convinced him to continue with Models and their next single, "Big on Love" produced by Reggie Lucas, was released in November 1984 and peaked at No. 24. Fellow Australian band INXS were fans of Models; their manager, Chris Murphy signed them to his MMA management company. The group created a hybrid of their alternative roots with a more commercial sound and, under the influence of Murphy, they reassessed their direction and moved towards a more radio-friendly format. By late 1984, Models relocated to Sydney and Duffield – with his crucial influence on the band's sound – was forced out by Murphy under acrimonious circumstances to be replaced by Roger Mason (ex-James Freud's Berlin) on keyboards and James Valentine on saxophone. Duffield released a solo album, Ten Happy Fingers in 1986 on his own Retrograde Records label. For touring during 1983 to 1985, the group was regularly augmented by backing singers Abeyratne and Ceberano; and in 1985, Canadian-born singer Wendy Matthews joined. Matthews and Kelly became a couple, remaining together for 11 years, and later founded the band Absent Friends. In early 1985, Models started recording material for their next album, Out of Mind, Out of Sight, produced by Launay, Lucas and Mark Opitz. A single from the album, "Barbados", was released in March, which peaked at No. 2. It was a reggae influenced song co-written by Freud and Duffield (prior to his departure). The song related a tale of alcoholism and suicide, it later provided Freud with the titles of his two autobiographies, I Am the Voice Left from Drinking (2002) and I Am the Voice Left from Rehab (2007). The video clip was influenced by the film, The Deer Hunter, it included a cameo by Garry Gary Beers of INXS and was directed by Richard Lowenstein. On 13 July, Models performed four songs for the Oz for Africa concert (part of the global Live Aid program) – "Big on Love", "I Hear Motion", "Stormy Tonight", "Out of Mind, Out of Sight". It was broadcast in Australia (on both Seven Network and Nine Network) and on MTV in the United States. Models went on a national tour with I'm Talking in July. In November, the band appeared on The Royal Variety Performance for Prince Charles and Princess Diana – Rocking the Royals at the Victoria State Arts Centre. The band released their most commercially successful work with the No. 1 hit single "Out of Mind, Out of Sight" in June and the No. 3 album Out of Mind, Out of Sight in August. "Out of Mind, Out of Sight" was the only No. 1 single on the Australian singles chart for 1985 by an Australian artist. (Midnight Oil's Species Deceases which peaked at No. 1 on the singles charts in December 1985 was an EP.) For the album, Models were Freud, Kelly, Mason, Matthews, Price and Valentine with Zan Abeyratne, and her twin sister, Sherine Abeyratne (Big Pig) on backing vocals. "Cold Fever" released in October was their next single, which peaked into the Top 40. It was followed by a Christmas single, "King of Kings", which contains portions of a speech by Martin Luther King, issued in December with all proceeds donated to the Salvation Army, but it did not chart into the Top 50. In 1986, Geffen Records released Out of Mind, Out of Sight in the US and it appeared on the Billboard 200 albums chart, with the single, "Out of Sight, Out of Mind", peaking at No. 37 on the Billboard Hot 100 singles chart. The band toured the US in November supporting Orchestral Manoeuvres in the Dark. In 1986, Models went to UK to record their next album, Models' Media, with Julian Mendelsohn and Opitz, at Trevor Horn's state-of-the-art SARM West Studios in London. Two singles peaked into the Top 30, "Evolution" in September, and "Let's Kiss" in November. Models' Media was released in December and peaked at No. 30 but was less successful than Out of Mind, Out of Sight. Models also featured on the Australian Made Tour of late 1986 to January 1987 with INXS, Mental as Anything, The Triffids, I'm Talking, The Saints, Divinyls and Jimmy Barnes on the ticket. "Hold On" was released in March 1987 and peaked in the Top 30, their final single was a cover of The Beatles' "Oh! Darling" in September which peaked in the Top 50. During 1987, Ceberano and Matthews sang together on the soundtrack for ABC-TV series, Stringer, the resultant album, You've Always Got the Blues was released in 1988, and peaked at No. 4 on the albums chart. Models members, including Mason as lead singer and Kelly on bass guitar, formed a side-project, The Clampetts, to record covers of nine country music tracks, which was released in 1987 as The Last Hoedown. Valentine left Models to pursue a radio and television journalism career. I remember in the late '80s I noticed James' [Freud] Record Company put out a press release that we'd split up, which was completely inaccurate. Because we had so many individuals in the group, we've always been able to sustain it in one form or another - and fortunately for me they've always let me be involved. As long as I'm there, we get to claim that continuity. Models' extended live exposure ensured that they stayed in the public eye when other contemporaries had been forgotten: the band's later work remained popular on radio throughout the 1990s; this, coupled with critical acclaim and cult appeal of earlier work, re-stimulated interest in their work in the latter half of that decade. The band reformed for a few gigs in 2000; in 2001 their rarities album Melbourne was released. Freud has written two memoirs, I Am The Voice Left From Drinking (2002) and I Am The Voice Left From Rehab (2007); the titles are both taken from "Barbados" and allude to his addiction with drugs and alcohol, and his subsequent recovery attempts. Kelly and Matthews formed Absent Friends in early 1989 which included ex-Models members Duffield, Mason and Valentine. With Matthews on lead vocals their 1990 hit single, "I Don’t Want to Be with Nobody but You" peaked at No. 4 on the ARIA Charts. The associated album, Here's Looking Up Your Address peaked at No. 7. Absent Friends disbanded in 1991 and Kelly fronted The Dukes from 1991 to 1994. Matthews provided a No. 11 hit with her first solo album Émigré late in 1990. She followed with Lily, which peaked at No. 2 in 1992, and provided her best performed single, "The Day You Went Away", which also peaked at No. 2. Matthews and Kelly separated as a couple in the mid-1990s. Duffield wrote music (including the theme) for the Australian children's TV series, Round the Twist; and in 2007 composed all music and sound effects for the TV comedy, Kick. Duffield teamed up with Phil Kennihan to found a successful advertising music partnership. Mason has composed soundtracks for many feature films and television series both locally and internationally. Valentine later worked in children's TV, was a popular radio host on 702 ABC Sydney and published a successful series of children's books. Price returned to New Zealand after stints with various Australian bands, and the world's first drum sample CD. Wednesday formed Crashland and plays with German avant garde band Einstürzende Neubauten. Various versions of Models have reformed on several occasions for short tours, including in 2006 and in September 2008. The 2008 version was: Kelly, Freud, his son Jackson Freud (from Attack of the Mannequins) on guitar, Tim Rosewarne (ex-Big Pig, Chocolate Starfish) on keyboards and Cameron Goold (Propaganda Klann, Christine Anu backing band) on drums. In August 2010, Duffield, Ferrie, Kelly and Price reformed for two concerts in Sydney and Melbourne. On 27 October, Models were inducted into the ARIA Hall of Fame by Matthews. The line-up of Duffield, Ferrie, Kelly, Mason, Price and Valentine performed "I Hear Motion" and "Evolution". Matthews recalled meeting the group for the first time at a recording session – she was due to provide backing vocals but they were busy playing indoor cricket in the studio. During the ceremony, Kelly explained Freud's absence by saying he had "another bicycle accident". A week later, Freud was found dead at his Hawthorn home on 4 November in a suspected suicide. A.^ "Early Morning Brain (It's Not Quite the Same as Sobriety)" was originally released by Models as a shared single with The Boys Next Door's "Scatterbrain" on the flip-side. B.^ Cut Lunch (EP) charted on the Kent Music Report Albums Chart, with "Cut Lunch" and "Two Cabs to the Toucan" as the most played radio tunes. "Cut Lunch" also peaked on the related Singles Chart. McFarlane, Ian (1999). "Whammo Homepage". Encyclopedia of Australian Rock and Pop. St Leonards, NSW: Allen & Unwin. ISBN 1-86508-072-1. Archived from the original on 5 April 2004. Retrieved 6 November 2010. CS1 maint: Unfit url (link) Note: Archived [on-line] copy has limited functionality. Spencer, Chris; Zbig Nowara; Paul McHenry (2002) . The Who's Who of Australian Rock. Noble Park, Vic: Five Mile Press. ISBN 1-86503-891-1. Note: [on-line] version established at White Room Electronic Publishing Pty Ltd in 2007 and was expanded from the 2002 edition. As from September 2010, [on-line] version appears to have an Internal Service Error. ^ a b Sutton, Michael. "Models – Artist Biography". AllMusic. All Media Network. Retrieved 27 August 2016. ^ "Mark Ferrie Biography : Music CV" (PDF). Mercurials.com. Retrieved 29 June 2014. ^ Knox, David (5 May 2014). "$500,000 prize won on Million Dollar Minute". TV Tonight. TV Tonight. Retrieved 6 May 2014. ^ a b c d e f g h i j k l m n o p q r s t u v w x y z aa ab ac ad ae af ag McFarlane, 'Models' entry. Retrieved 6 November 2010. ^ a b c d e f g h i j k l m n Holmgren, Magnus; Baird, Paul; Aubrey, Ross; Acosta, Lisa. "The Models". Australian Rock Database. Passagen.se (Magnus Holmgren). Archived from the original on 12 June 2012. Retrieved 12 February 2014. ^ a b c d e f g h i j Nimmervoll, Ed. "Models". Howlspace. Archived from the original on 27 July 2012. Retrieved 22 January 2014. ^ Nimmervoll, Ed. "Models More". Howlspace. Archived from the original on 27 July 2012. Retrieved 23 January 2014. ^ a b c d e "Australian Rock by Memorable TV L to M". Memorable TV. Archived from the original on 17 October 2008. Retrieved 3 March 2009. ^ a b c d e f "Local Songwriters – The Models". Mushroom Music Publishing. Archived from the original on 18 September 2009. Retrieved 6 November 2010. ^ a b c d e f g h i j k l m n o p q r s t u v w Kent, David (1993). Australian Chart Book 1970–1992. St Ives, NSW: Australian Chart Book 1970–1992. ISBN 0-646-11917-6. Note: Used for Australian singles and albums charting until ARIA created their own charts in mid-1988. ^ Kimball, Duncan (2002). "Split Enz". Milesago: Australasian Music and Popular Culture 1964–1975. Ice Productions. Retrieved 6 November 2010. ^ Beck, Chris (13 September 2005). "Mecurials on the rise". The Age. Melbourne: Fairfax Media. Retrieved 6 November 2010. ^ "Resume: Mark Hough". ArtsHub Holdings Australia Pty Ltd. Archived from the original on 23 July 2011. Retrieved 6 November 2010. ^ "Models". Internet Movie Database (IMDb). Retrieved 6 November 2010. ^ a b "Talking Heads - Wendy Matthews". Australian Broadcasting Corporation (ABC). 30 May 2005. Archived from the original on 17 May 2013. Retrieved 6 November 2010. ^ ""Barbados" at APRA search engine". Australasian Performing Right Association (APRA). Retrieved 6 November 2010. ^ a b Freud, James (2002). I Am the Voice Left from Drinking: The Models from the 'Burbs' to 'Barbados' and Beyond. Sydney, NSW: HarperCollins Publishers. ISBN 978-0-7322-7440-5. Retrieved 6 November 2010. ^ a b Freud, James (2007). I Am the Voice Left from Rehab. North Sydney, NSW: Random House Australia. ISBN 978-1-74166-556-7. Retrieved 6 November 2010. ^ Jean-Manuel Esnault, Daniel Agudo Rodríguez (ed.). "Review of the "Oz for Africa" benefit concert broadcast by MTV". liveaid.free.fr. Retrieved 6 November 2010. ^ Hutchence, Tina (2001). "Rocking the Royals and Dogs in Space". Just a Man - The Real Michael Hutchence. Pan Macmillan. ISBN 0-330-39019-8. Retrieved 6 November 2010. 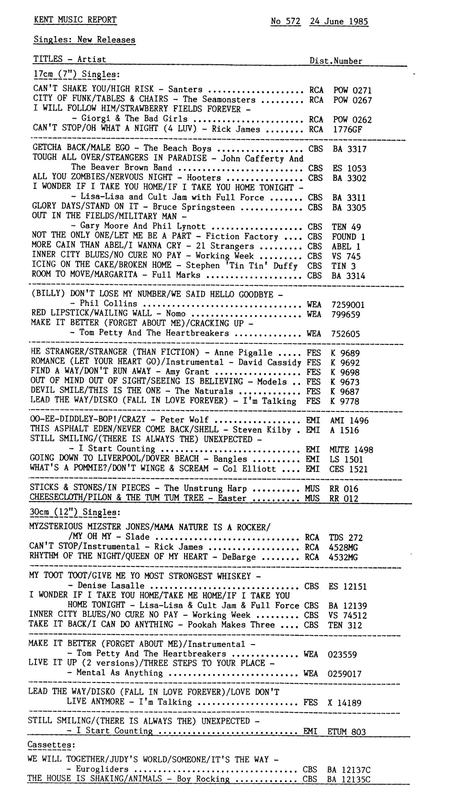 ^ "Kent Music Report No 572 – 24 June 1985 > Singles: New Releases". Imgur.com (original document published by Kent Music Report). Retrieved 28 November 2017. ^ a b c d e "Billboard Albums". Allmusic. Rovi Corporation. Retrieved 6 November 2010. ^ a b c "Models > Charts & Awards > Billboard Singles". Allmusic. Rovi Corporation. Retrieved 6 November 2010. ^ a b "Models band members (archive copy)". Angelfire.com. Archived from the original on 1 September 1999. Retrieved 6 November 2010. ^ Eliezer, Christie (29 July 2008). "The models hear motion". The Music Network. ^ a b c Ford, Kelly (August 2008). "Sean Kelly is a Model Man". Citysearch Australia Pty Ltd. Archived from the original on 14 February 2009. Retrieved 6 November 2010. ^ a b "Discography Absent Friends". Australian charts portal. Hung Medien. Retrieved 6 November 2010. ^ a b c "Discography Wendy Matthews". Australian charts portal. Hung Medien. Retrieved 6 November 2010. ^ "Andrew Duffield". Internet Movie Database (IMDb). Retrieved 6 November 2010. ^ Cashmere, Tim (28 July 2006). "Models reform for Homebake Festival". Undercover News. Undercover Network Pty Ltd. Retrieved 6 November 2010. ^ Cashmere, Tim (18 September 2008). "Models to Reunite Next Week". Undercover News. Undercover Network Pty Ltd. Retrieved 6 November 2010. ^ Watt, Andrew (15 July 2010). "Models' Sean Kelly Interview". Hey Hey My My. Archived from the original on 9 March 2012. Retrieved 6 November 2010. ^ Australian Association Press (AAP) (28 October 2010). "Old talent time: ARIA honours music legends". Australian Broadcasting Corporation (ABC). Retrieved 28 October 2010. ^ Treuen, Jason (28 October 2010). "ARIA Hall of Fame celebrates music's loved ones". The Music Network (Peer Group Media). Retrieved 29 October 2010. ^ Street, Andrew P (25 October 2010). "Models inducted into ARIA Hall of Fame". Time Out. Time Out Group. Archived from the original on 30 December 2012. Retrieved 28 October 2010. ^ a b Pepper, Daile; Murfett, Andrew (4 November 2010). "Models' frontman tragedy: James Freud takes own life". The Sydney Morning Herald. Fairfax Media. Retrieved 4 November 2010. ^ a b "Discography Models (AU)". Australian charts portal. Hung Medien. Retrieved 6 November 2010. ^ "Who's who of Australian rock / compiled by Chris Spencer, Zbig Nowara & Paul McHenry". catalogue. National Library of Australia. Retrieved 6 November 2010. This page was last edited on 23 April 2019, at 19:03 (UTC).